One reason we have been recently insisting upon classical movies in Star Campus is possibly that we are all too much hyped up about graphics and insane clips. One of the least appreciated way that classics are reviewed, is that they give insight into the past for future generations. Well, we want our readers to experience what their grandfather/fathers loved before them. Okay, I won't be your granny anymore, so let's get on to the main story. So what's the big deal with Brian De Palma's Scarface? How did a movie that was hated upon its release 20 years ago become a media phenomenon? 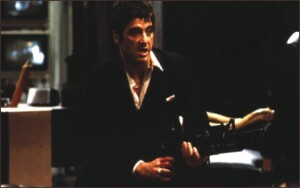 To be honest, Scarface isn't exactly what you could call a "good" movie. It's overwritten, overacted and overdirected (not to mention overlong). And yet, against the odds, it still works; there was not one moment during the film's near three hour running time that I grew bored or restless. Granted, there were some scenes that had me giggling and others that left me a little perplexed, but at no point did I find myself checking my watch waiting for the damn thing to be over. Unlike the movie I reviewed last week. One of the reasons Scarface works so well is that it is a perfect portrayal of the era in which it was made: the 1980s. The floral men's wear, the forest pants, the rusty rugged looks of the actors, the plot, setting everything was notoriously 80's. 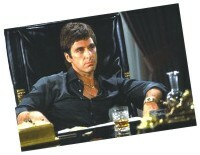 Cuban refugee, Tony Montana is played by Al Pacino. A lifelong criminal who was in and out of prison in his native Cuba before being thrown on a boat bound for America, Tony nurses a strong sense of entitlement. In his mind, because of his hard work, he deserves everything the world can offer him: wealth, women and power. Possibly sums up the theme 'The World Is Yours'. But by the end of Scarface it has become clear that while Tony owns all of things he ever could desire, it's not enough to make him happy. Indeed, he only grows more paranoid and distraught as his wealth increases. In this way, "The World is Yours" isn't a promise, it's a dare: The world is yours, but is that really what you want?